This new work is a direct result of the work that people associate me with. 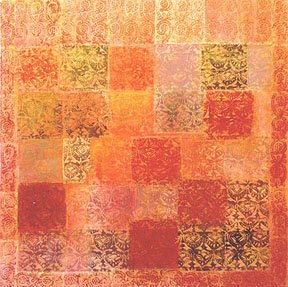 In the bright, whimsical work the focus was on the subject, heavily decorated with patterns. What has happened now is that the patterns have become the focus. The colour palette has changed to deep rich colours,I am also using mixed media such as bees wax, acrylic medium, and paper. Resulting in a rich, deep, heavily layered, piece. 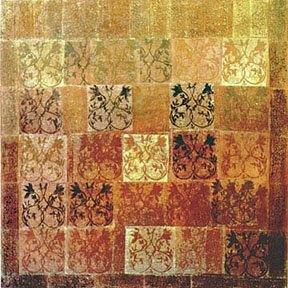 When I started this series I was using old batik blocks. Now I enjoy creating my own designs and carving them out myself. 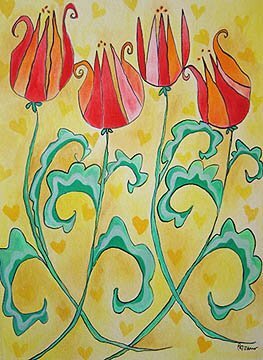 14"x16", acrylic on watercolour paper is for sale, unframed or framed. 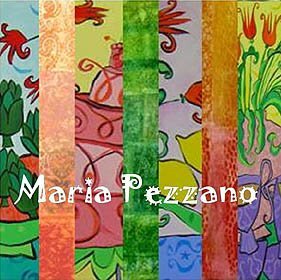 Maria Pezzano works in a wide variety of media, from acrylic to encaustic, on materials including canvas, masonite and cotton. She has completed commissioned murals on the walls of central downtown establishments in her native Guelph, Ontario, Canada, including the Paradiso Meditteranean Cafe, Trasheteria Dance Bar, Jimmy Jazz, Thomas Video & Entertainment, the Guelph Co-operators and most recently the Diana Restaurant, as well as in the surrounding Southern Ontario area in the Paradiso (Peterborough) and Blue Dog Bagels (Waterloo). One of Maria's largest commissions can be seen on the walls of the Northern Telecom head office in Brampton, Ontario, where she has completed thirteen paintings for their cafe. Maria has also done a great deal of illustrations for Revlon Canada. Revlon has launched its new Arts and Medicine Program. 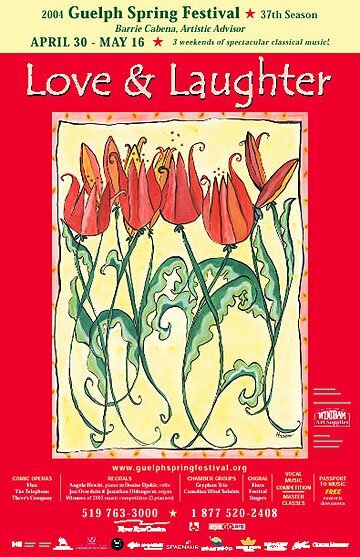 Maria's illustrations were incorporated in the Arts and Medicine journal/workbook where women with Cancer can express themselves through their creativity. Maria's most recent commission is a mural for the Guelph Community Health Centre in downtown Guelph. The mural, an adaptation of "hey diddle diddle" is in the children's library on the second floor. For two years Maria owned and operated a small gallery in downtown Guelph, which combined both studio and display space; currently, she works out of her private studio in downtown Guelph. 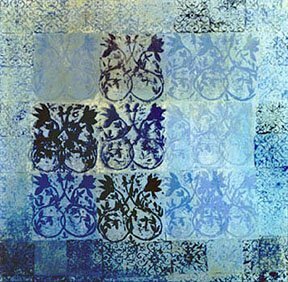 Maria's work is housed in private collections in Switzerland, Sweden, Italy, Germany, Hong Kong, Australia, the United States and across Canada from Nova Scotia to British Columbia. "Tea Cup, Tea Pot, Tea Cup"
One of 13 paintings of the Northern Telecom commission '96. Acrylic on canvas.